Today’s lovely Guest Post is from fellow blogger Becky at A Beautiful Space. Enjoy! 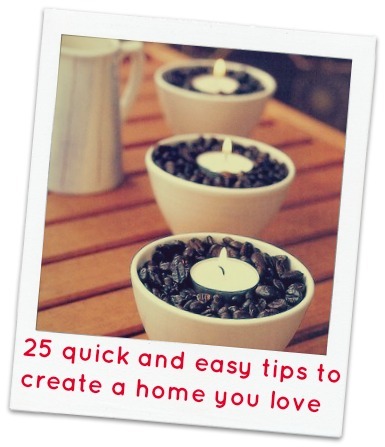 Design blogs like this one really inspire me to make my home gorgeous. I love my home to look nice but as a busy mum on a budget it is simple, speedy, low cost solutions that work best for me. Over at my own blog Family Budgeting I have been undertaking a home makeover on a budget. Along the way I have picked up some fab tips I’d love to share with you here. Know what you like, in spite of trends. It’s your home. Have a ‘vision’ for your room (make up a mood board or do a doodle) this will give you focus. New tea towels, a matching oven glove and brighter light bulbs can TRANSFORM a kitchen. Don’t underestimate what you can achieve with a small outlay. Ask a trusted friend for feedback on what is/isn’t working in your home. Good storage is a sound investment. Have a hidden storage space and utilise it well to store what you don’t need. Follow William Morris’ advice and just keep the beautiful and useful to hand. Deal with your mail and recycle then respond asap. Piles of mail say you have a neglected home. Ditch your dead plants and flowers as soon as they go over they just shout I don’t care. Keep your home tidy. Messy houses hide away your lovely things. Look around for inspiration but always remember who you are and what your family love and want from your home. Colours create moods so a little sunshine yellow may be lovely at a breakfast bar and sea green may give you a zesty bathroom. Play around with fabrics and paint pots to get what you want. The best homes make the people who live there happy, comfortable and proud. Make sure you can tick these three areas or change something! Thank you so much Becky, we absolutely LOVE your top tips! What lovely, sensible and down to earth tips! Thanks Carolin, they are fab tips aren’t they! Brilliant tip, love this!! My favourite is flowers, I can fall in love with a room again when there are fresh flowers! I know what you mean, fresh flowers can really lift and finish off a room beautifully. I agree – these are easy-to-follow and practical tips we can all learn from! Tip no.20 is certainly interesting, I’ve never thought to give my front door much attention. Thanks! these are easy-to-follow and practical tips we can all learn from! Tip no.20 is certainly interesting, I’ve never thought to give my front door much attention. Thanks! Thanks for the great tips. I need to get the clutter out of my home. Any tips on a wonderful fragrance?